This place makes me incredibly peaceful inside and out. Maybe not necessarily the destination in full, but the combination of being able to see some new sites, taste delicious food, tip back a little scotch, and get some quality time with my guy, the whole picture…life is good! I have such an appreciation for Minnesota already as my home state, but if there is one place that is the shining gemstone of MN, it is the North Shore (a close second is our home😊) We have been to a few stunning places and have been fortunate enough to stay in rad accommodations as well. (Bluefin Bay and Superior Shores) We would recommend both to others, right off the water and in close proximity to landmarks, they both are beautiful places to stay. 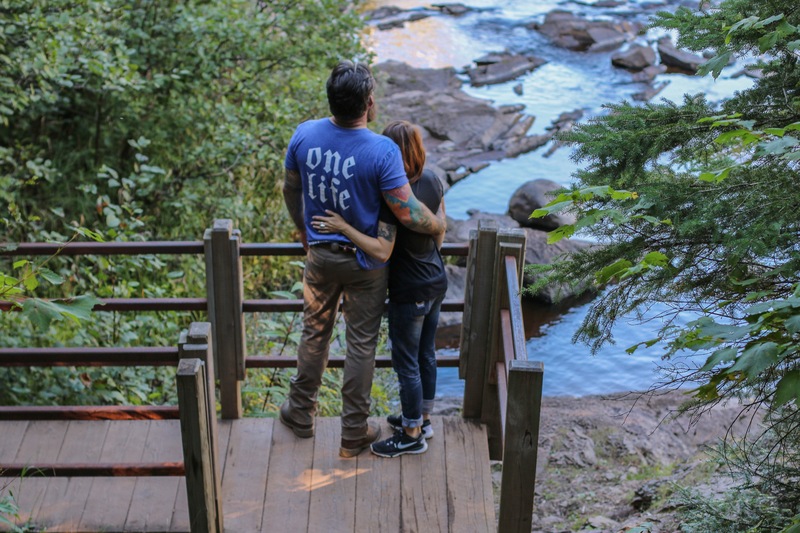 But nevertheless, each time we visit here or will visit, I have an overwhelming sense of nostalgia for our first roadtrip together to Tofte. It never fails that we have lots of laughs, in depth conversations (not all since we have some pretty goofy ones as well), and both have a genuine passion to admire the natural world and what Mother Nature has so kindly given us to enjoy anywhere we go, including our own backyard. In a world ravaged by negativity; we can so easily escape it and focus on what matters. Focus on all of the little things, find the beauty in what surrounds us, and be thankful for it. I’m overjoyed to have a partner to share in these joys and passions with. In the most recent trip, we stayed at Superior Shores in Two Harbors. The room was enormous and featured two fireplaces, a balcony, full kitchen, a jacuzzi tub, and a separate master bedroom. The view overlooked the Superior bay and was about 2 minutes from town. We both were able to kick back and relax with ease. The pool on site was great as well, it had an indoor and outdoor hot tub; perfect for easing the mind and body. They also had a large sauna which Branden insisted on booking me alive. Ha! We were able to get out and see the harbor, explore some local agate shops, and hike Tettegouche. I would suggest visiting Cascade National Park, Tettegouche, and the Split Rock Lighthouse if you pass through the area. Cascade offered plenty of hiking, waterfalls, photo opportunity and wildlife without being overcrowded with other tourists. Tettegouche was the same, we went on a weekday and didn’t share our view with anyone else while we were there. We also stopped by a marina near Two Harbors that had an extremely rocky jetty. That was also neat to see all the boats, the boys will enjoy seeing that one day I’m sure. And now we have some new, cherished memories to carry with us; thanks to my phenomenal guy for surprising me and taking me for my birthday! And also a huge thanks to his brother and sister-in-law for watching Orion for the few days we were gone, we were able to catch some z’s and recharge! Grand Marias sounds pretty epic too, I have yet to venture that far North, but if anyone has places or suggestions that are must sees, or little slices of paradise you’ve found in your travels, do share! I hope we will take the boys up there next spring or summer for camping since Orion will be a little older. Can’t wait to show them some of our memorable spots one day! And what’s better than getting to know our home state even more and what it has to offer.